Director of Exhibits Edgar Lee Hewett recommended that Jesse Logan Nusbaum (1887-1975), his colleague at the School of American Archeology and Museum of New Mexico, be hired as superintendent of construction of the Santa Fe exhibit, to be known as the “Painted Desert” or “Indian Village,” highlighting the culture and accomplishments of Native Americans. In 1912 Nusbaum, as supervisor, and Julian Martinez, as foreman, had remodeled the Palace of the Governors in Santa Fe, New Mexico. Julian, a Tewa Indian from San Ildefonso, was the husband of the potter Maria Martinez, who later would become famous for her black-on-black pottery. Nusbaum and Martinez set up the Indian Village exhibit for the Panama-California Exposition. Nusbaum supervised twenty-three Indians during construction, most of whom were from the San Ildefonso Pueblo in New Mexico’s Rio Grande Valley. Indians leveled and smoothed a mesa rising above a canyon on the east. They found a layer of clay below the surface of the Painted Desert and converted the clay into adobe for use on buildings and on a wall surrounding the compound. They also made thatch out of leaves, stems and branches for use on roofs. Nusbaum was a skilled photographer and took many photos of the Painted Desert. 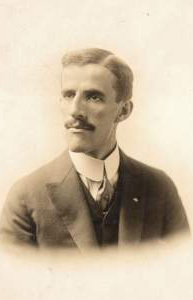 Jesse Logan Nusbaum was the first archaeologist hired by the National Park Service. In 1921 he became superintendent at Mesa Verde National Park. …Adapted from his biography at the National Park Service website and from the book Balboa Park and the 1915 Exposition by Richard W. Amero.